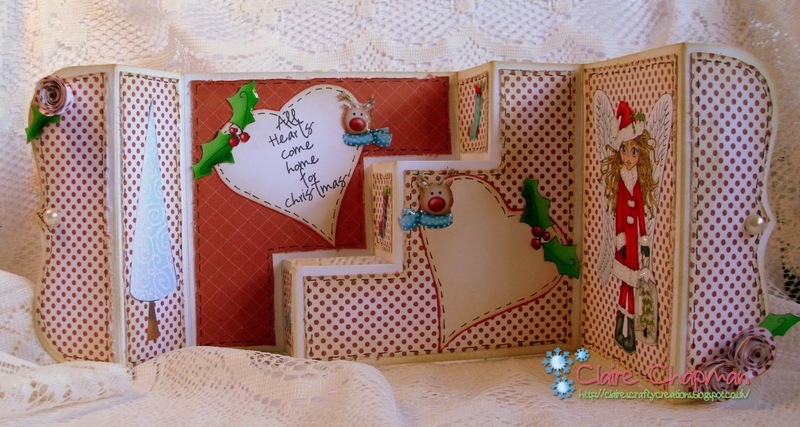 Studio 12: altered notebook ! Hi all! Miria here with a new project for Studio 12. 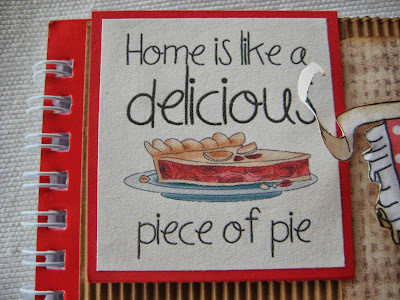 Today I've altered a notebook! 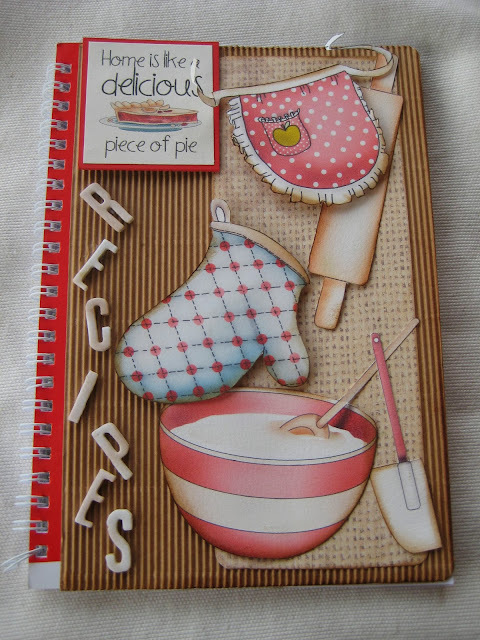 My sister likes cooking, she's so good at cake design so I made her a recipe book where she can takes notes. 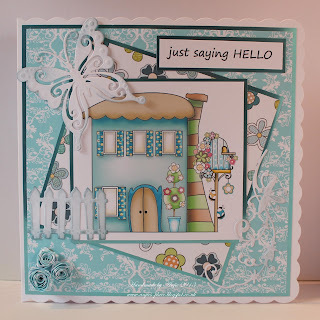 I adhered some corrugated cardstock to the cover and found easily all the images I needed on the Welcome Home section of the endless inspiring cd Studio 12 Picknix Collection 1, cut them out, distressed and sticked with 3d foam pads. 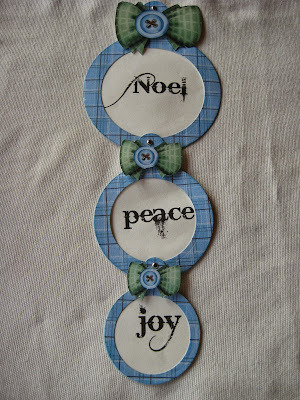 I added a sentiment from the same cd and the word "Recipes" made with die cut letters. As explained last week we have tweaked our challenge rules and from last weeks challenge onwards we shall be picking a RANDOM WINNER each week to get one of our great prizes! WOOHOO!! We're doing this as a massive thanks to you all for entering each week and we think it's much fairer that everyone gets an equal chance to win some lovely goodies, no matter how great your technique for colouring is! So from now on, if you enter then you're in the draw! We will still choose our favourite top 3 as well and they will receive a little prize too. IN ADDITION, you can now enter as many challenges as you wish and are no longer restricted to 10! 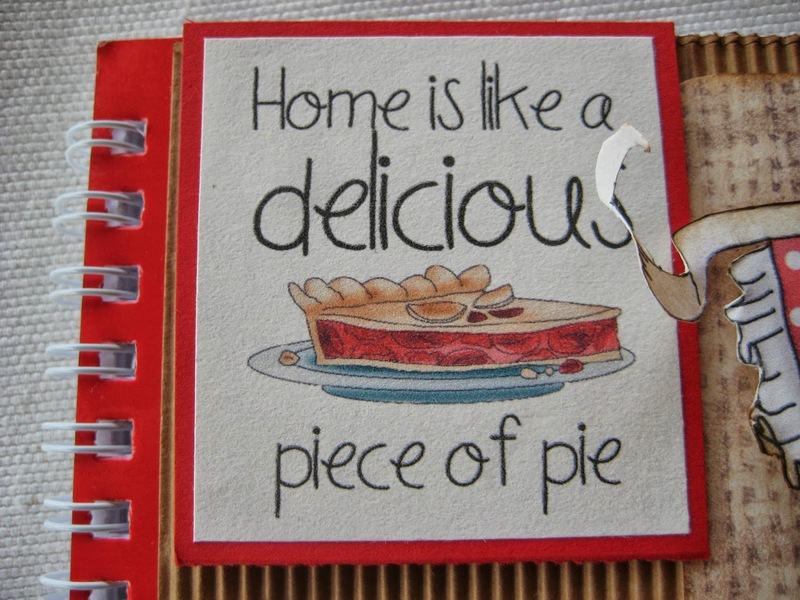 and you win the brand new Christmas Collection, "Home for Christmas"... please email Nikky quoting the following code PD1W39a37 to claim your prize. 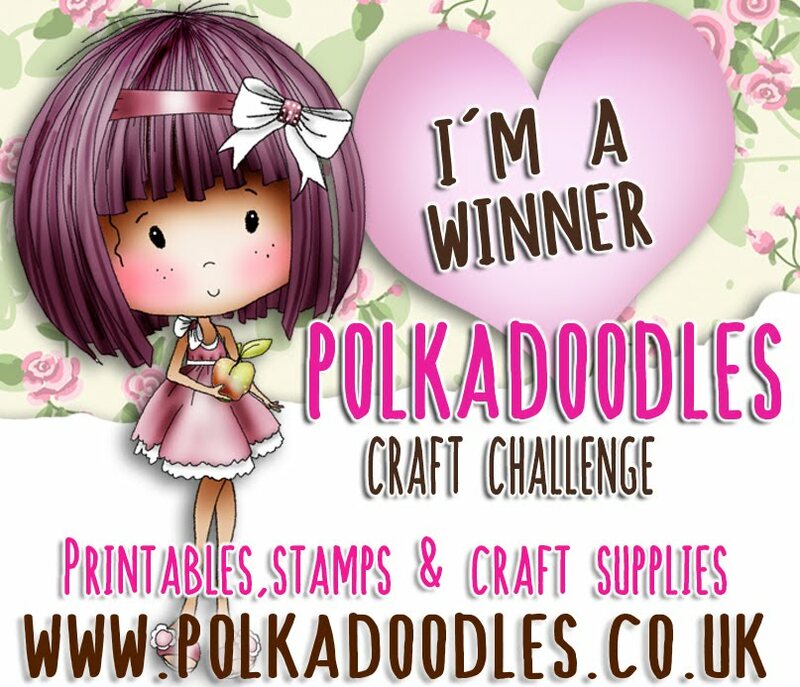 Please email Nikky quoting code PDTOP3W37 to claim your download prize. and the randomly chosen challenge winner will win all of the BRAND NEW Halloween download kits ..... Witchie, Witchie and Witchie Journalling cards ... WOW! Sally - Oh I love this new Home for Christmas CD Rom. There is so much to chose from and all the images/characters and papers are lush! 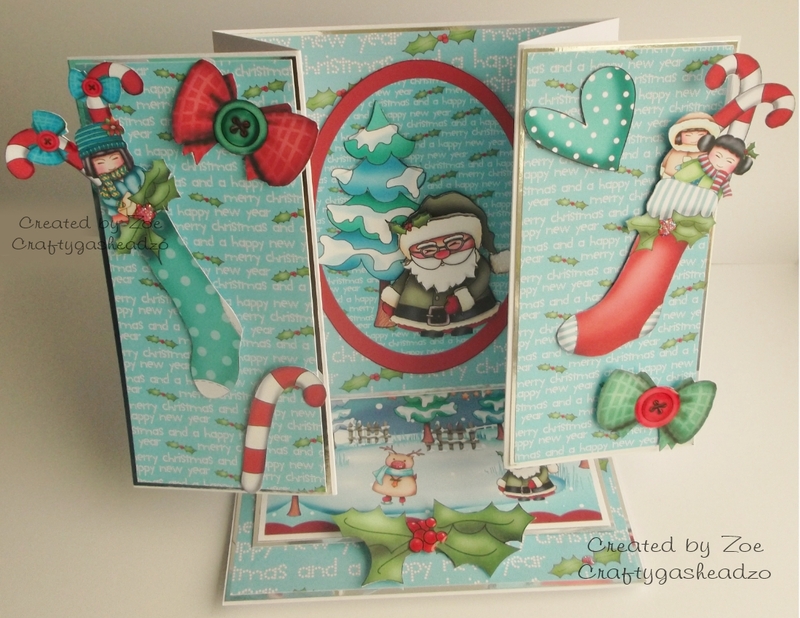 I have done a gate fold card today, first time I have done this type of card, but I think it turned out ok. I used one of the digi images and coloured her first with Promarkers and Graph'it markers, then picked the backing papers. 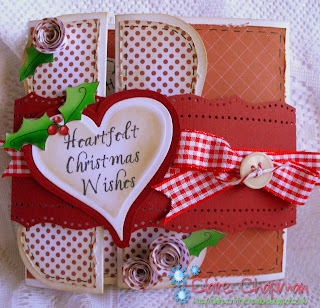 Cut out the centre of the card with a Spellbinders die, I backed the front/back sides with the backing papers, dangled her on a piece of ribbon and added a holly embellishment. for the front I added a heart and two of the little houses and a sentiment. 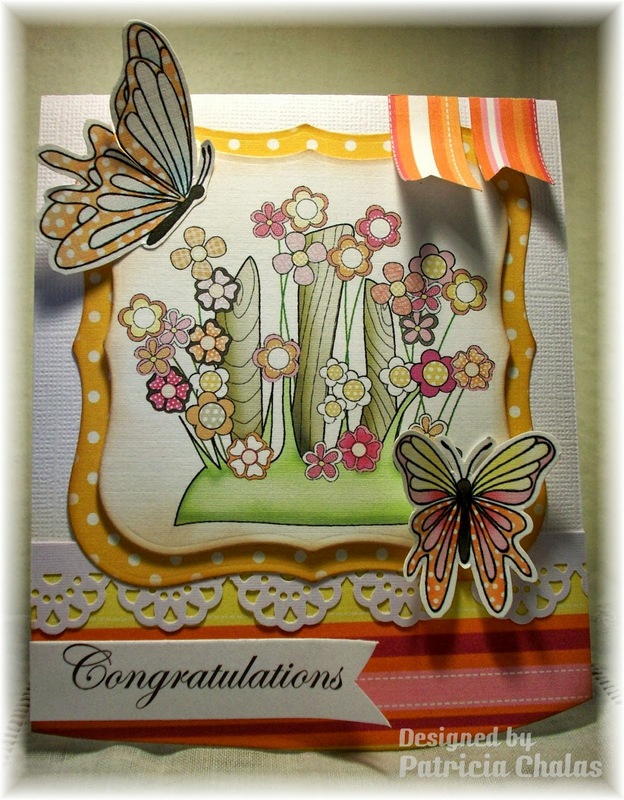 Zoe - I really enjoyed this challenge, I've made a card that I've not created before & that is an easel base card with a fold-back card on the top! 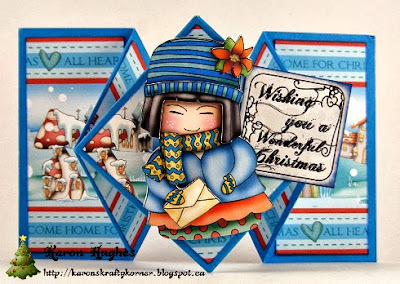 I used the fabulous Home For Christmas collection - printing off papers, decoupage and lots of gorgeous embellishments. It was easy to do once I got my head around putting the 2 card types together. I finished it off with a touch of sparkle & glossy accents. 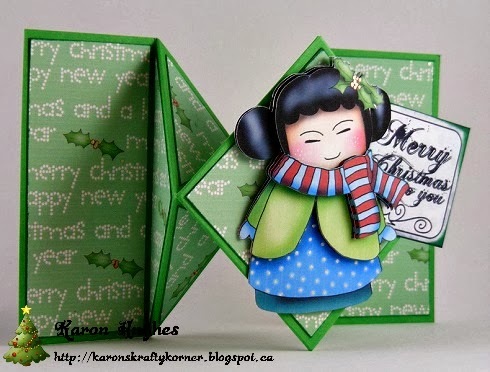 Asha - I used the adorable Angelberry Christmas CD to make this variation on a square tri-fold card. And to step up the festivity I added sheer ribbon, liquid pearls and bling. Alethea - I decided I wanted to try something new this week and saw this modified tri-shutter card so thought I'd give it a go! Everything I used on my card is from the Angelberry cd collection then I just added the heart charms, and kindyglitz everywhere. Miria I made a door decoration just for a change. I used paper, bow and sentiments from very inspiring new CD, Home for Christmas . I die cut them all and kept together with brads. You can see it open and folded. 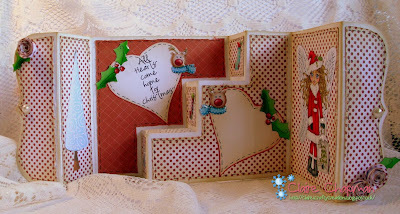 Hi everyone today I have made a criss cross card using the Angelberry Christmas CD. 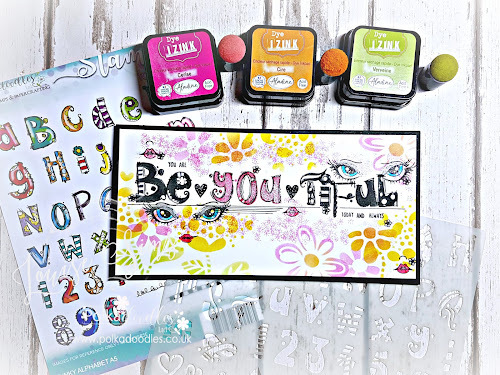 My papers are all from the CD, as is my little bingo card, the sentiment and trees inside and of course the stunning digi stamp on the front which I coloured with pencils, check out my Blog for more details! Lidia Hi! 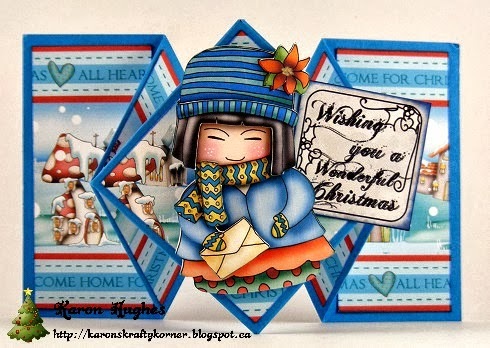 Everyone and for this Challenge I Made a simple Card whit a Christmas Tree made whit squares and the Tea Bag Technique and a Beautiful Angelberry Pressies Digistamp so I Hope you Liked, the papers are from the Sundae of Seasons CD-Rom Collection. Hopefully the DT have inspired you to make your project for this weeks challenge and we can not wait for you to share it with us. Please use Mr Linky to add your details so we can come over and see your project in full. 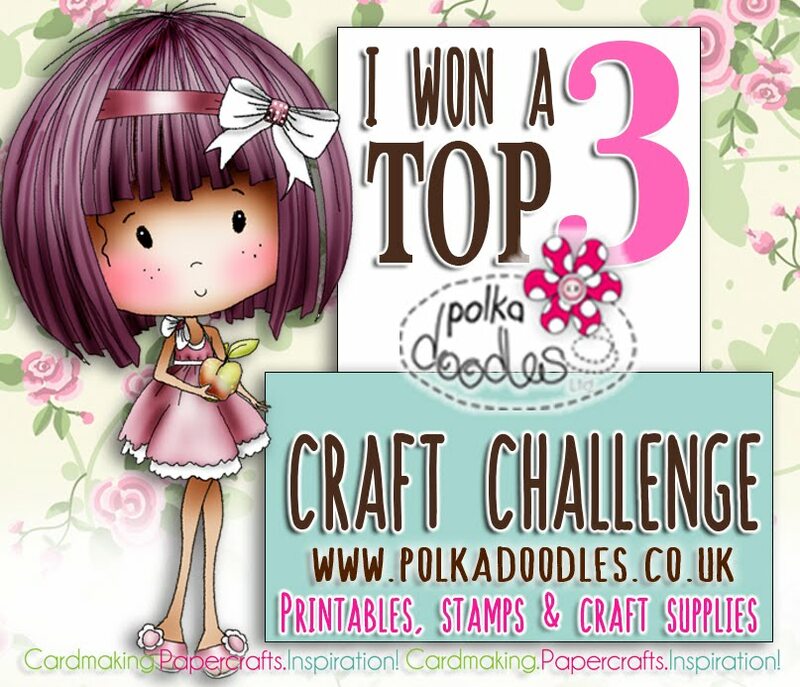 Remember you have until Sunday 6th October noon to enter this challenge. Hi there, it's Karon here and my turn to share this weeks tutorial with you all. 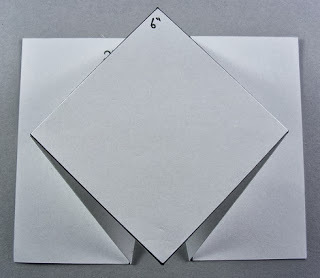 I am going to show you how to make a Diamond Fold card. Hope you will give it a go. 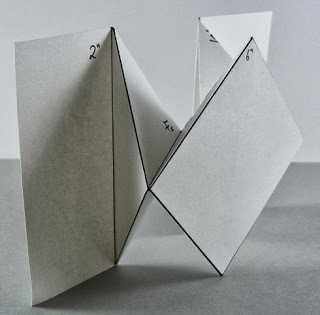 You will need a 12" by 12" piece of card stock, from which you can make three card bases using this fold. Cut a 12" by 4" piece of card stock and lets begin. 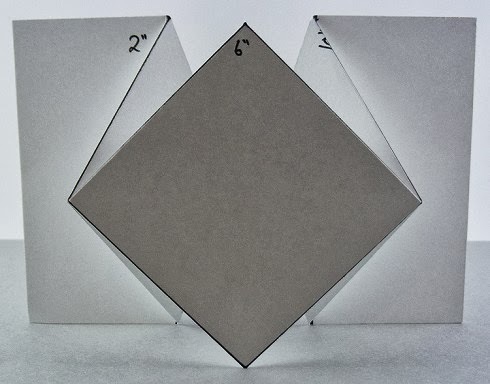 Firstly, score at the 2", 4", 8" and 10" points. Next you will need to put a small pencil mark at the 6" point, at the top and bottom, this is for the position of the next score marks which are going to be diagonal. Score from the top of the 2" point to the bottom 6" mark, and from the bottom of the 2" point to the top 6" mark. Then the same for the other side, so from the top of the 10" point to the bottom 6" mark and from the bottom of the 10" point to the top 6" mark. It should look like this. 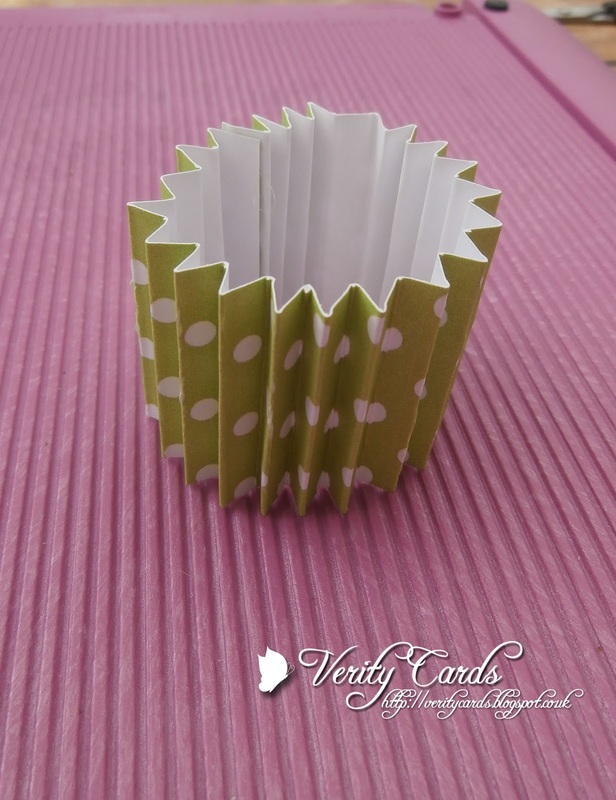 Start off by making all the vertical lines, valley folds. Your diagonal folds are to be mountain folds. Make them nice and crisp with your bone folder. Once scored this way, you will all ready see your card base start to form - so it should look like this. Next, all you need to do is push the ends towards the middle and then push down on the centre diamond to flatten your card. When closed it will look like this. Then this is how it looks standing up. One more to the side to make sure you can see how it works. Hey, it's Friday! Hello everyone and welcome to another challenge! Now, before we even get started we have some great news for you all - from today's challenge onwards we shall be picking a RANDOM WINNER each week to get one of our great prizes! WOOHOO!! 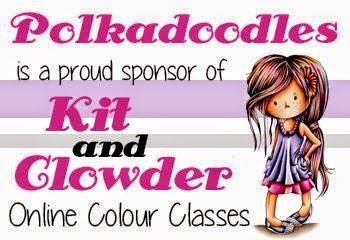 We're doing this as a massive thanks to you all for entering each week and we think it's much fairer that everyone gets an equal chance to win some lovely goodies, no matter how great your technique for colouring is! So from now on, if you enter then you're in the draw! We will still choose our favourite top 3 as well and they will receive a little prize too. IN ADDITION, you can now enter as many challenges as you wish and are no longer restricted to 10! 1st Place - Wisienor - please use the code PD1W36a34 to claim your prize which is a massive DigiWorld Download bundle! 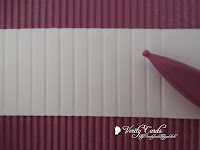 We want you to show us your loveliest colour combo's which remind you of Sweet Combinations! The winner of this challenge will get the Home for Christmas collection shown above and our Top 3 will all receive a download. Please don't forget our rules - they are at the bottom of this post otherwise you won't be in with a chance to win! Ruth: I've kept it rather clean and simple this week! 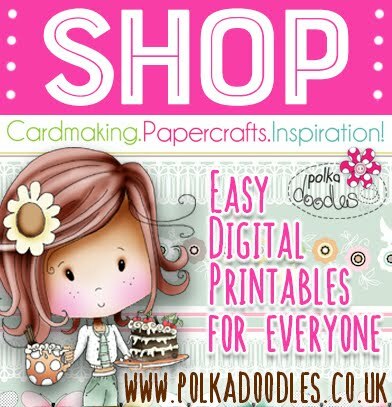 I've a stack of little envelopes that I need to use up as I bought them in the January sale as they were really really cheap - 4p (although they did come with little Christmas cards that were really naff - I did only buy them for the envelopes!) for 20 or 25 in a pack. So I indulged and bought rather a few. 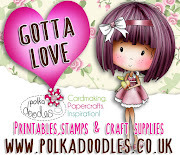 So, this brings me to these little cuties - I made 3 cards from a sheet of A4 card and printed one of the images from the fab Bonbon Belles straight onto the card and embellished with half pearls, stickles, embroidery thread and a button. 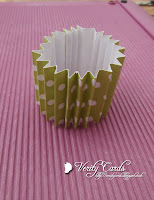 Really quick and simple to make! 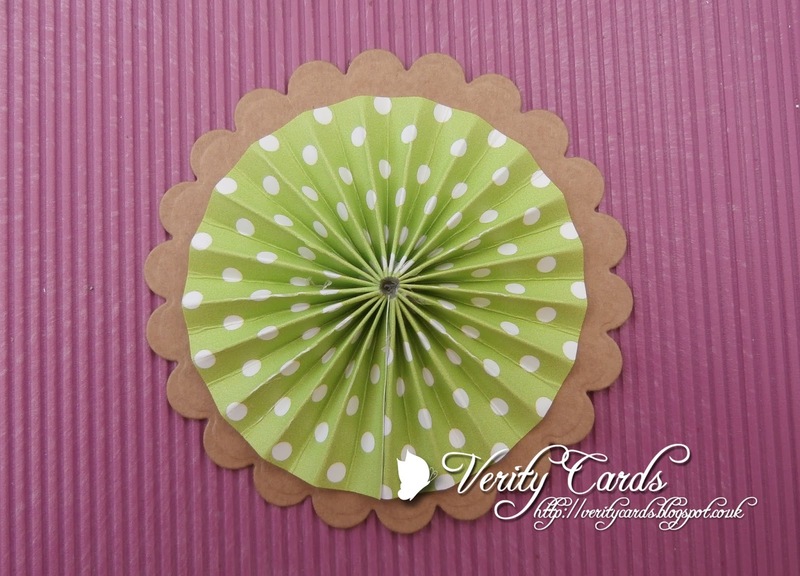 Shell- For my candy colours I went with the chocolate and lime section of the Bonbon Belles CD and as I love this sentiment I used a pre coloured butterfly image. I decided to keep it as a cas card, I just added a sentiment from the same CD and a few pearls, the corners started life as just metal silver corners and I covered them in frantage. JAN - I decided to make a scrapbook layout this week using the fabulous 'Bonbon Belles CD'. I couldn't resist this picture and the 'Marshmallow Fluff' collection was just perfect for the job. 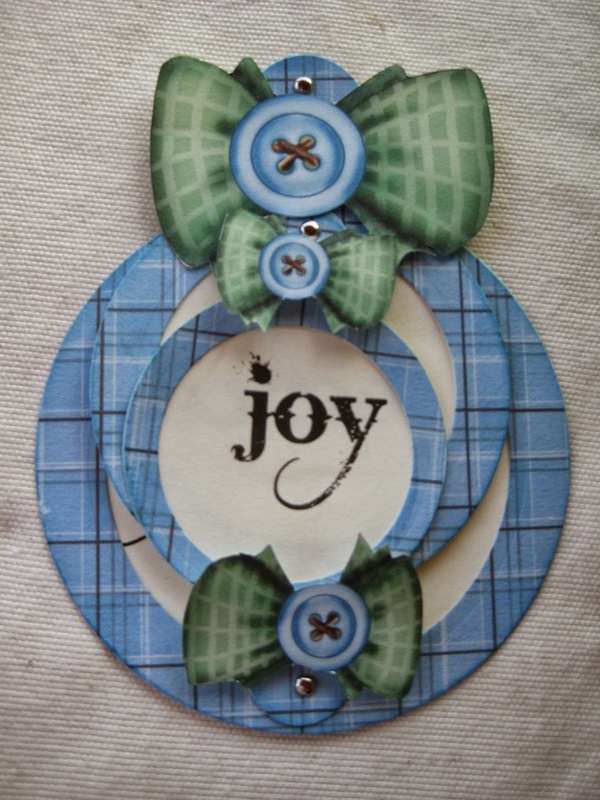 I used six different papers and a couple of gorgeous little bows which is just a taster - there is so much more available and five other collections to choose from as well! 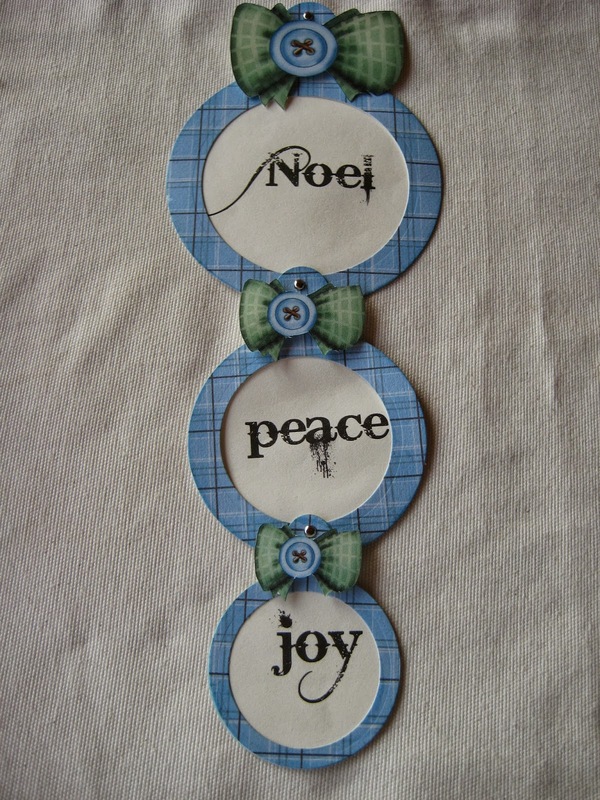 I've made a little scene with 4 of the images and added some die cuts. 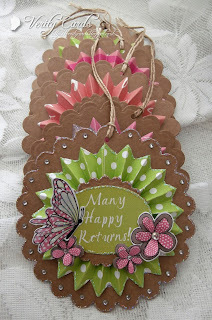 Lizzie - I thought I would make these bright and cheerful gift tags. 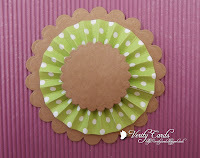 I used Bonbon Belles CD for my papers and my embellies. I used my Stickles to glitter around all the edges. 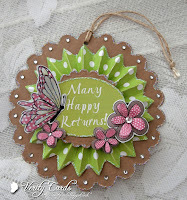 When it was dry I placed my sentiment from the CD on the middle then decorated with butterfly and flowers and of course gems ! Its my turn to do the tutorial this week so go check it out !! 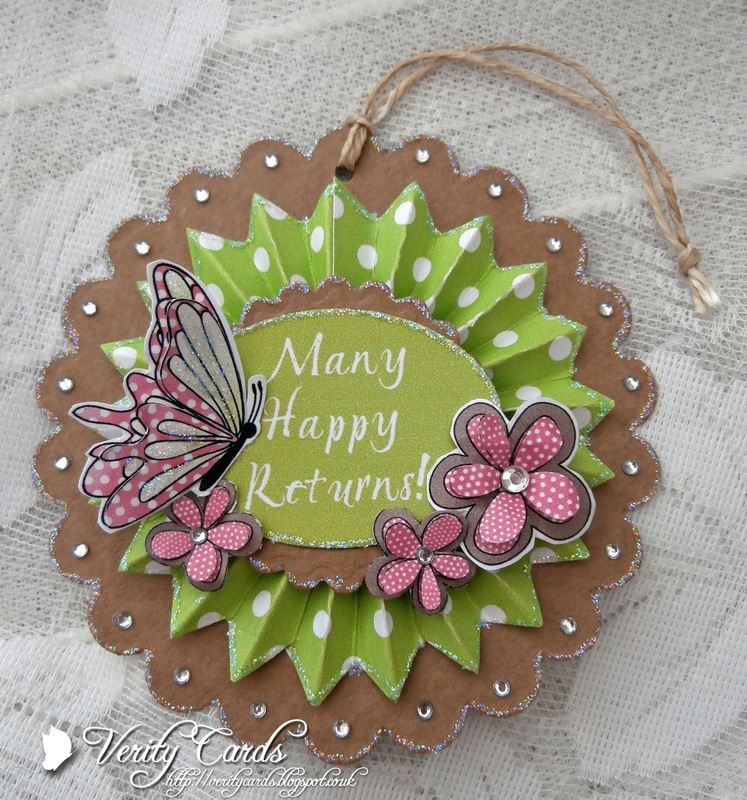 Patty: I made this card specially for my Mother's Birthday this past monday. 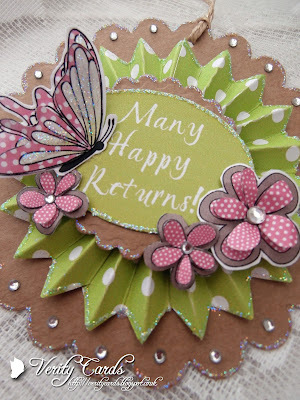 All papers, butterflies, fence and sentiment are from I BonBon Belles CD. I just ink the edges and combine the colors and arrange the butterflies to make the look feels cute and simple. I know that she would love it... 'cause she loves flowers. 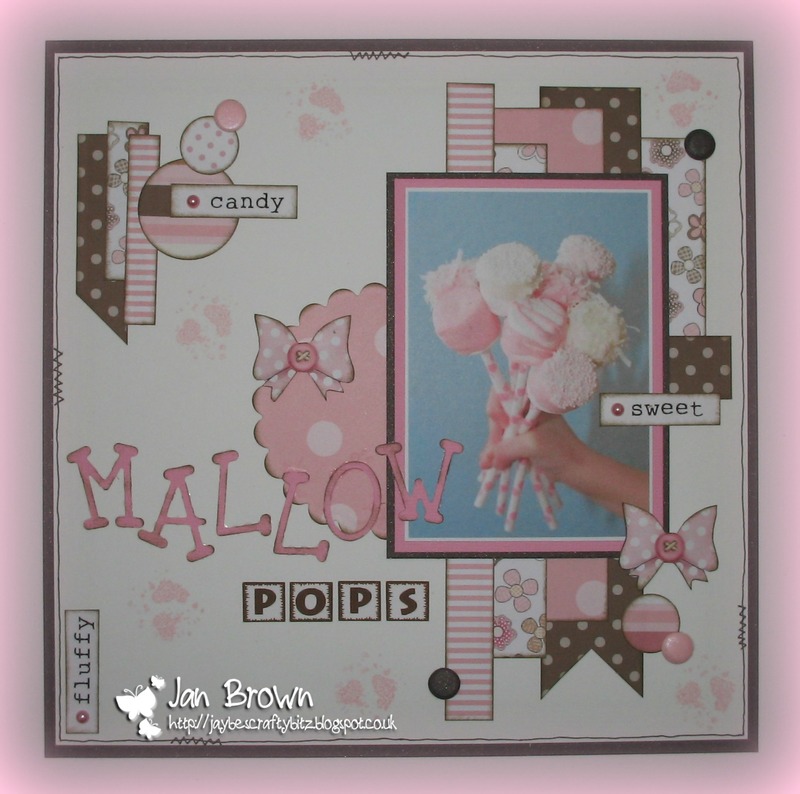 Lou: I used the Bonbon Belles CD too to make my card and have wanted an excuse to use the adorabe cherry images for ages and this weeks theme fits in beautifully. 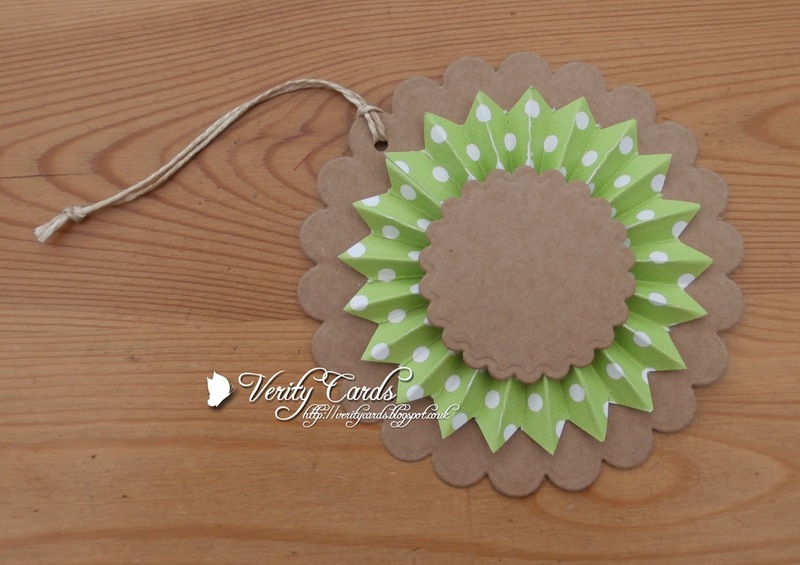 Cheeries have been placed on to a doily and embellished with a crochet flower, button & ribbon. Sentiment ticket is also from the CD. Card finally finished with some brads for added colour. 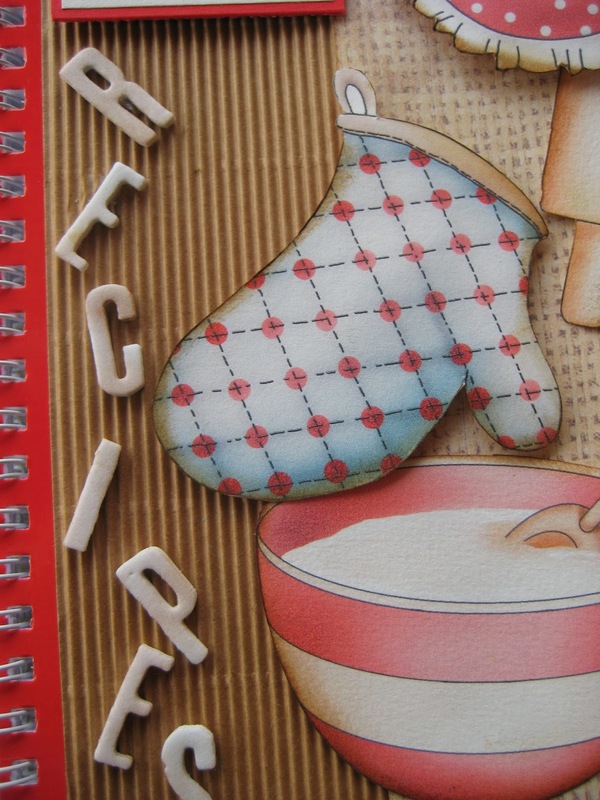 The only sad thing about my card is that I really wanted to glaze the cherries but can't find my glaze. That can only mean one thing .... I need to tidy up! Now it's your turn and you have until 12noon on Sunday 29th September to enter and Good Luck! 4. If you have word verification on your blog it really does slow us down when leaving comments - please consider turning off word verification especially as the comment moderation has a spam section. Lizzie here!!! Its my turn this week to do the tutorial. 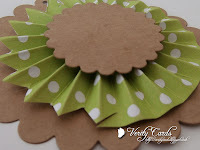 I had no idea how to make a rosette! So I thought I would use one in my tutorial this week. Sometimes we overlook the simplest of things! 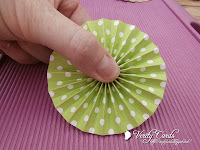 circle dies - a large and a small one. 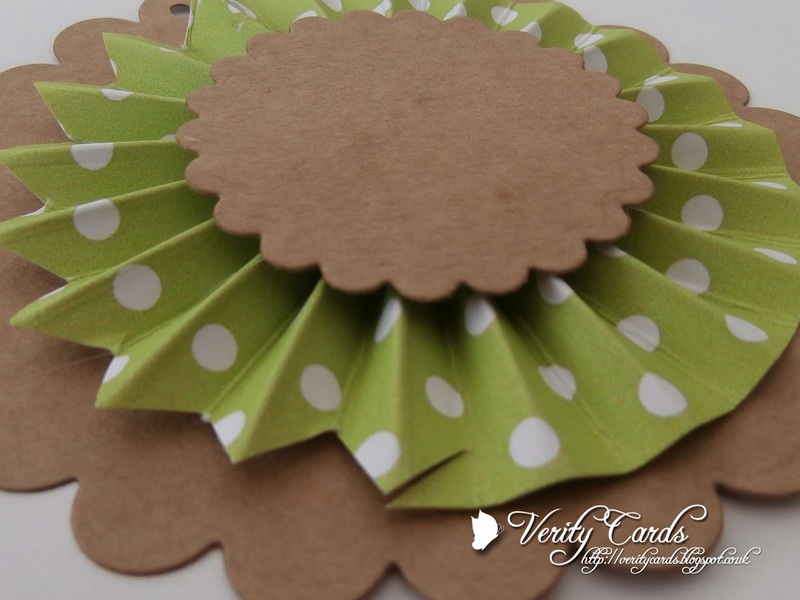 Cut strips of paper 1 1/4" x 11"
Score a strip of paper every 1/4"
Hot glue the ends together so it makes a circle. and folding it in on itself to make a circle. HOLD tight with your fingers! folded paper onto the glue, holding in position until it is dry. 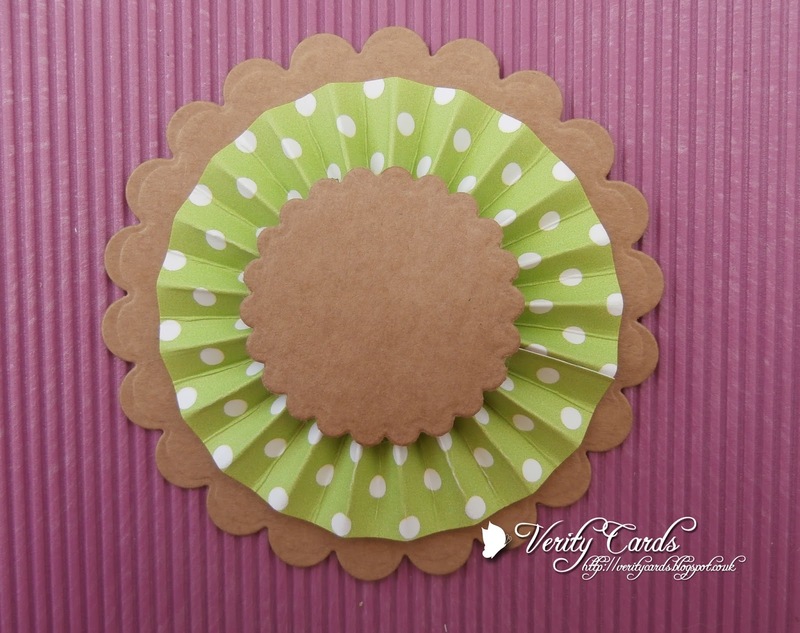 Then hot glue the smaller circle on top of the paper. I used Kraft card as I liked the contrast to the candy colours. Now punch a hole in one of the scallops of the tag. 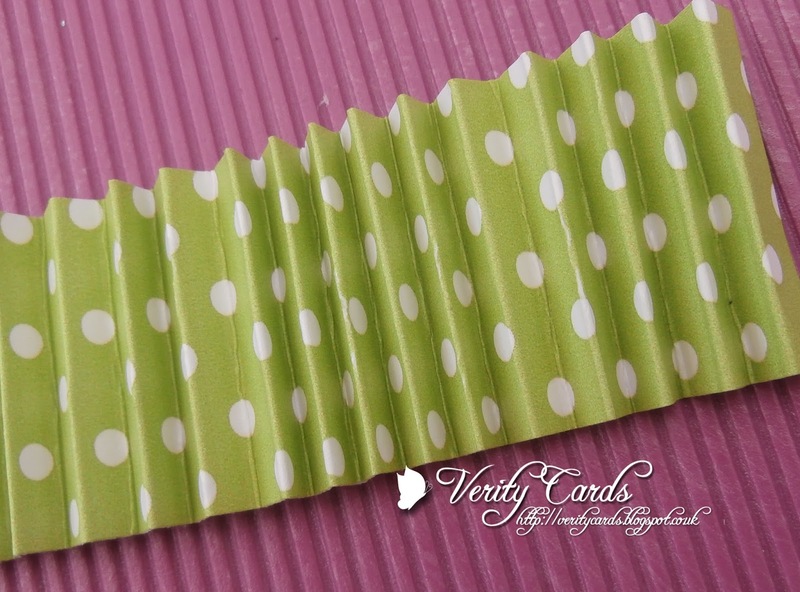 into a zig zag using the folds. Tie a piece of string through the hole. Now the tag is ready for decorating! I used my Stickles to glitter around all the edges. butterfly and flowers and of course gems! Studio 12 Stamps meet Halloween digis! For a Boy Magic Slider card tutorial! 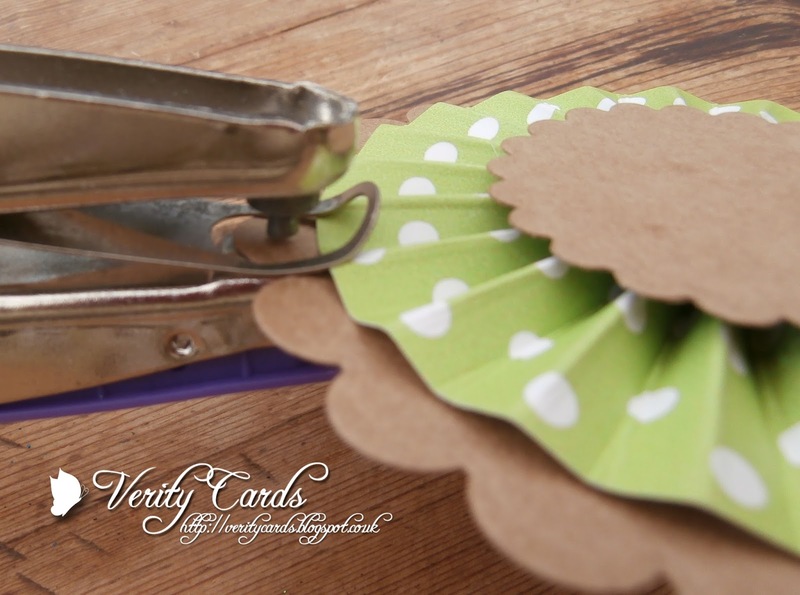 Studio 12 - Acrilic Post it Holder!